Protec is a premium plus high performance gloss alkyd emulsion enamel, which is uniquely formulated for a wide variety of surfaces and conditions. Protec has strong corrosion resistant properties making it an excellent choice as a rust preventative coating on metals. 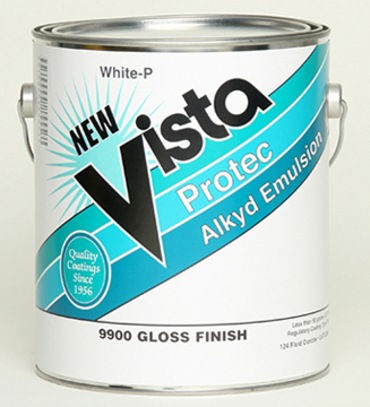 Protec alkyd emulsion can be used as a DTM on properly prepared surfaces (for more information regarding DTM applications, contact a Vista Representative). In addition, it has excellent resistance to abrasion, moisture and chemical fumes. Protec can be used as an industrial maintenance coating on metal, wood, concrete and masonry. It is a super compliant "green" coating that is designed for use on all interior / exterior architectural surfaces and has very low odor. Recommended Uses: Properly primed interior/exterior concrete and masonry, wood (i.e. doors & frames) and metal (i.e. doors & frames, garage doors and wrought iron surfaces that require a tough, durable, washable surface. NOT RECOMMENDED OVER UNPRIMED GALVANIZED SURFACES.